Is the Canon EOS Rebel SL3 around the corner? Is the Canon EOS Rebel SL3 about to update the company's entry-level DSLR portfolio? If the rumors are true, that's the next new camera we'll be seeing from the Japanese camera giant. Camera-leaking website Nokishita has claimed that a camera that was previously registered with the radio wave authority with the code 'DS126761' will be the EOS Rebel SL3. The camera is said to have Wi-Fi and Bluetooth, and uses the LP E17 battery, which is currently employed by the EOS 200D / Rebel SL2, in addition to the EOS 77D, the EOS RP full-frame mirrorless camera, and M-series cameras. There's no official word from Canon itself, and there doesn't appear to be any further evidence to back this up, but Nokishita has a good track record of breaking details of upcoming cameras. The model would likely replace the EOS 200D / Rebel SL2, which Canon introduced in June 2017 at the same time as the full-frame EOS 6D Mark II. Two years is a long time for an entry-level camera to be on the market, and pressure on Canon increased last year, as Nikon found time to release a more up-to-date D3500 challenger. Canon has only released two DSLRs since then, the EOS Rebel T100 / EOS 4000D and EOS 2000D / EOS Rebel T7, although it also recently launched its EOS R system, and continues to develop its EOS M line. 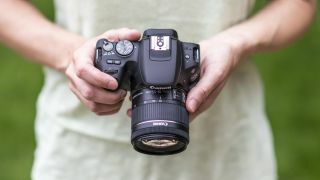 It has, however, pledged to continue developing its DSLR line, and there's no reason to doubt that claim as its junior DSLRs are still big sellers. One issue is what the camera would be called in the UK. Having already launched the the EOS 100D / Rebel SL1 and the EOS 200D / Rebel SL2, convention dictates that the next model would be christened the EOS 300D – although this DSLR already exists. The Canon EOS 300D, which was also known as the Kiss Digital and Digital Rebel, was launched in 2003, and is best known for being the first DSLR to be priced at under $1,000. So, we could potentially see this newcomer being called the EOS 250D or similar – if, indeed, it does arrive. Canon's last big reveal was the EOS RP, a budget full-frame mirrorless camera and the second model in its new EOS R system. The company is currently developing six new lenses for the system.